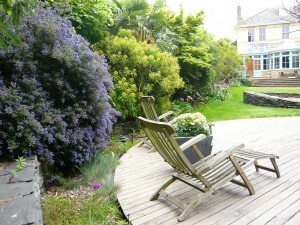 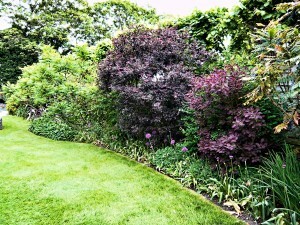 Site description: A large suburban garden facing south. 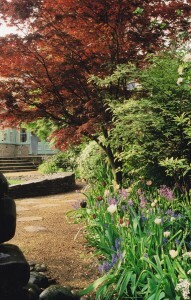 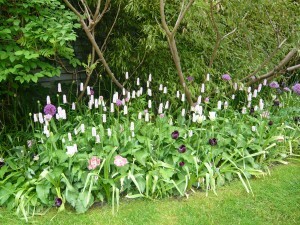 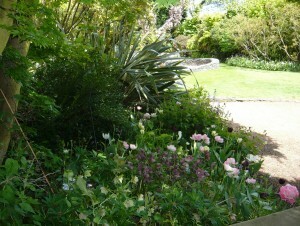 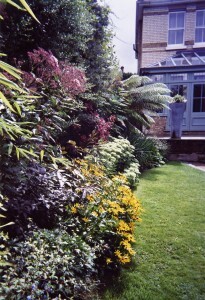 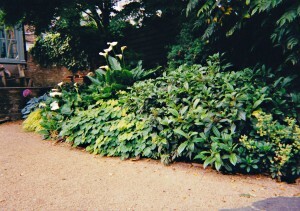 The garden slopes slightly towards the end. 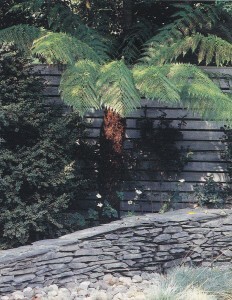 The brief: A contemporary garden that matches the interior of the house. 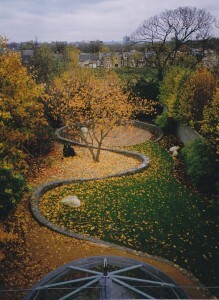 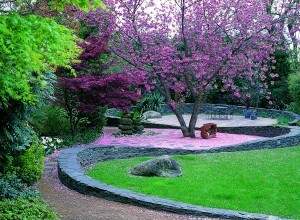 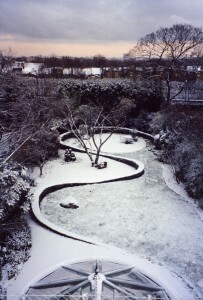 The design process: the design for this garden creates three different areas with a long sculptural wall that sweeps and curves like an arch around the cherry tree. 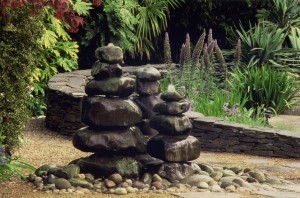 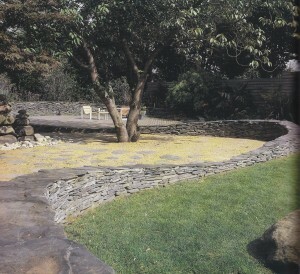 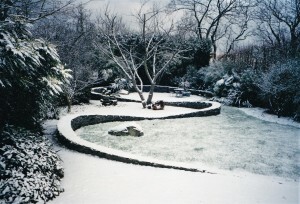 The wall and water feature was inspired by the work of Andy Goldsworthy, and the shapes in the design by the gardens of Burle Marx. 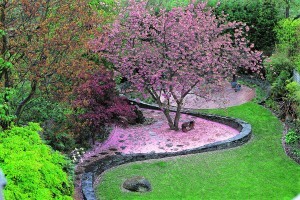 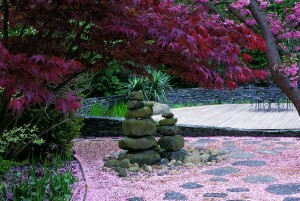 The new shapes form an abstract design around the garden and the leaves and blooms of the cherry tree create a colourful pattern on the ground in spring and autumn. 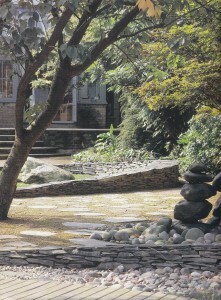 Major hard landscape material: Slate, self-binding gravel, cobbles and decking. 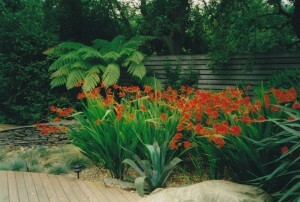 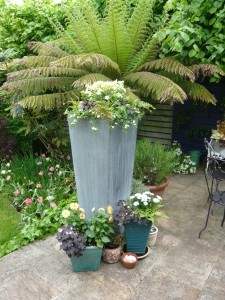 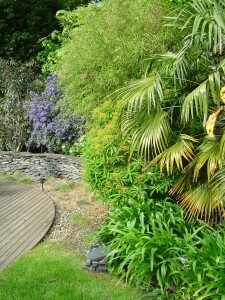 Major soft landscape material: Eucalyptus parvifolia, Acers, dicksonia antartica, Hostas, trachycarpus fortunei, phormiums. 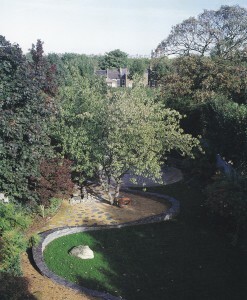 The final result: A dynamic design where art, colour, land art, plants, patterns, texture, leaves and shapes create dramatic moods during the year.